When you hear vinyl flooring, many people picture outdated and worn-out sheet vinyl used for kitchen floors back in the day. But, today’s vinyl flooring is known as “luxury vinyl” for a reason. It is a whole new category of flooring that combines all of the best attributes of vinyl (including easy maintenance, durability, and comfort) with high-end looks that can fool even the most discerning eye. Available in planks of varying lengths and widths as well as tiles of different sizes, luxury vinyl can mimic the look of real hardwood, ceramic, and stone. Basement flooring can be tricky because it is an area of your home that is traditionally prone to moisture and potential water damage. 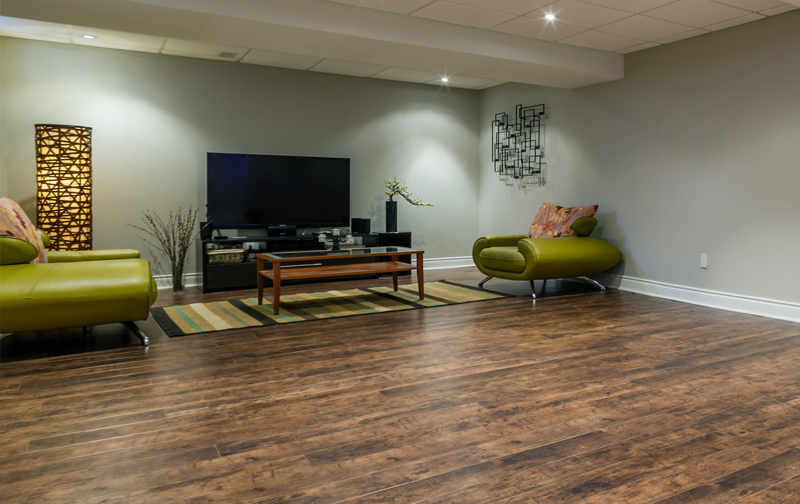 Basements are also often used as entertainment areas so you want a floor that can stand up to spills and stains. Luxury vinyl meets all those demands and more. Water-resistant, stain-resistant, and scratch-resistant—it’s the practical flooring choice for your basement. Add in the fact that you can select a high-end look (such as natural hardwood, ceramic, or stone), and you’ll create a space that you’ll be proud to show off when entertaining for years to come. Luxury vinyl gives any room the look of more expensive natural flooring such as hardwood, tile or stone at a much more affordable price. Great designs and patterns in an easy-to-care for package. There’s a lot to like when it comes to luxury vinyl, and it is a flooring trend that’s here to stay. Stop by our Indianapolis flooring store to see for yourself. Set a time to meet with a Kermans designer to learn more about the benefits of luxury vinyl flooring and see samples in person. Your home is your biggest investment. If you are remodeling your basement and have questions about choices for its floors, our experienced design pros are here to help. Bring us your basement remodeling project’s challenges, and we’ll give you customized recommendations for the best new floor options—without pressure to buy.